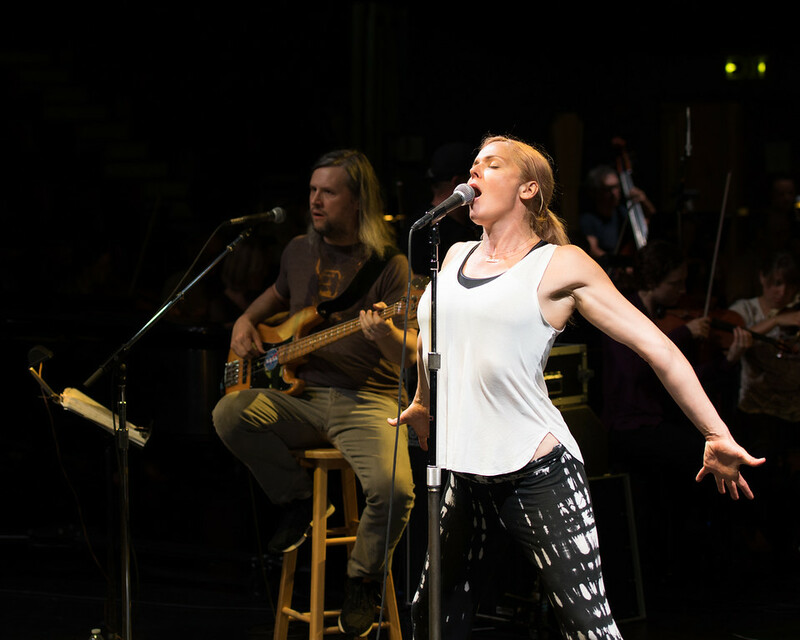 On June 3rd, the Santa Cruz Symphony (SCS) performed with Storm Large and her band in Lust, Love & Rock ‘n Roll. Flavored by the musical talent and provocative nature of dynamo singer Storm Large, the show was the most spicy and avant-garde performance of the Symphony’s 2016/17 Season. The SCS and guest musicians performed familiar hits spanning the ’30s through the ‘90s. They formed a powerful collective – Maestro Daniel Stewart excels at leading the orchestra in stunning collaborations with guest musicians and singers. While Large rightfully stole the spotlight with her sparkling humor, honesty, and jaw-dropping vocals, her several band members and the Santa Cruz orchestra burned brightly behind her. Together they created an intimate atmosphere, evoking the raw, wild emotions of romance and rock ‘n roll with electric musicality and passion. For audience members used to a more traditional experience of the Symphony and songs, the show’s blend of classy and crude may have come as a surprise. The performance featured rebellious interpretations of classic songs by bands including Frank Sinatra, Queen, Aerosmith, Elton John, as well as samples from Large’s one-woman show, Crazy Enough. Large poured her heart into every lyric with soulful intent and impressed with her soaring vocal range. She also brought her confident, witty personality to the stage. She was sultry, naughty, and shocking in some moments; deep, reflective, and sensitive in others. Stewart and the orchestra’s refined poise and impeccable timing balanced Large’s colorful personality and versatility as a musician. In recent years, Large has become a sensation in the classical music world. Since shooting to fame as a 2006 finalist on the CBS show Rock Star: Supernova, and debuting in 2011 with the band Pink Martini, she has toured internationally to perform with many highly esteemed musicians and orchestras. By sharing the Civic Auditorium stage with Large, the Symphony continues its growing reputation for making world-famous artists accessible to local audiences. It also shows the SCS commitment to taking risks, exploring boundaries, and honoring musical genres from the past as well as the present. While the performance was mesmerizing, the flow and informality of the production felt jarring in moments. The moody, changeable technical lighting seemed awkwardly unfinished for such a high-caliber show. As well as providing entertainment, this benefit concert was supporting the SCS Music Education programs through proceeds from tickets and a live auction. Held during intermission, the bidding of local items felt slightly distracting and lengthy in between such an intoxicating experience of music. However, the friendly call to action welcomed a positive and generous response from the crowd, indicating our community’s desire to see the inspiring Symphony programs thrive, and to ensure that local children have opportunities to learn music. 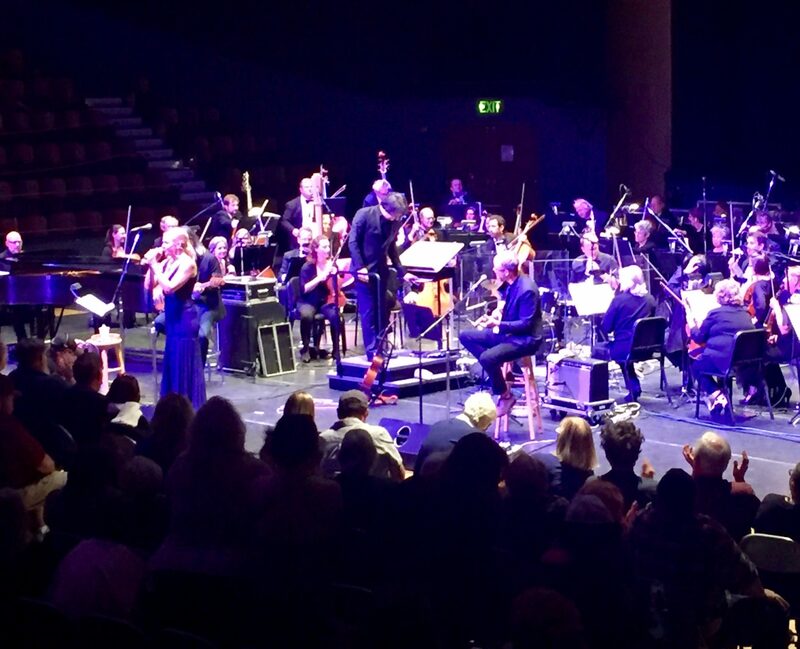 The steamy, high energy show won Large many new fans based in Santa Cruz, and celebrated our local Symphony’s community spirit, artistic diversity, and forward-thinking approach. The unpredictable, exciting nature of Lust, Love & Rock ‘n Roll was yet another indication that the Santa Cruz Symphony is full of surprises.